I’m a self-proclaimed organization ‘geek’. Nothing makes me more happy than school supplies on sale this time of year. In fact, when I was little, I would save up my money to go to the office supply store and buy folders, pens, and sticky-notes. I know…I was a teacher in the making for sure! First, let’s talk about the benefits of getting organized. Clutter and disorganization can lead to a lack of focus, inefficiency, stress, frustration, and needless effort expended on less-meaningful and impactful tasks. Oftentimes when I feel overwhelmed by life, the first thing I want to do is clean up. When my home and workspace is clean and organized, I can then tackle the other things on my mind. Often I cannot focus on my “real” problems and issues until I get my environment in order. Sound familiar? On the contrary, having organized spaces and systems (at home and school) can reduce the amount of time and energy you expend on lesser-important tasks so that you can redirect that energy and keep it focused on your students, family, and self! 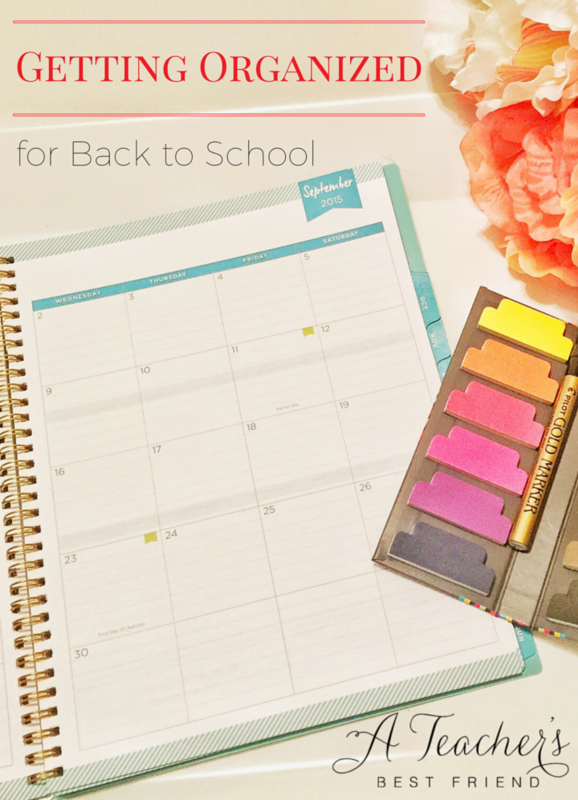 Getting organized for back to school will set you up for success! Organization and systems are personal. I know this because I spent hours on Pinterest boards on organization and purchased every planner on the market with the hope that someone else’s system will work for me – but in the end, my favorite and most effective organization systems are those I made up myself in order to solve a problem at hand. It’s worth the thought process below and some creative problem solving to create an organized life! Organization includes both organized spaces and organized systems. Getting organized is a two-pronged approach. First is organizing your spaces and second is creating systems to reach all of your goals (whether its providing quality feedback on student work, or getting all the laundry and yard-work done each week). Organization is a habit not a task. While getting organized usually happens once or twice a year (usually new years and back to school), the key to successful organization is to commit to daily maintenance. That doesn’t mean you have to exert major effort every day. But you will be more successful at maintaining your systems if you make organization a habit not a task. In fact, if doing a major organization overhaul is overwhelming to you at this time, just organize one space or one system each week. Taking small bites of the “elephant” can actually help you develop the habit of organization and make you more successful in the long-term. Think about the intention of the space. What is the space used for? What is it’s purpose? What needs to happen/occur in that space? Declutter the space. Over time, spaces acquire clutter of all sorts: unnecessary or misplaced items that just never have been moved and sometimes even trash! This is the opportunity to clean out and that simple effort alone is often very cathartic! Redesign the space to fulfill the intended use of the space. I suggest removing everything from the area, sorting like items into baskets and bins (and even labeling them), and then placing them back into the space in a way that will enable the outcome you want for the space. Think about your intended outcome and the frequency of the task. What do you want the system/process to accomplish? How frequently does this outcome need to occur? For example, if you are wanting to devise a system for recording your observations about student progress, how often do you need to collect that informal data on each student? Daily? Weekly? Declutter your system/process. What is part of your system now that isn’t working? What isn’t necessary about the process? For example, in order to cook healthy meals, your system may include meal planning, creating a grocery list, grocery shopping, and food preparation. Consider if anything about your system is unnecessary (or able to be changed). In this example you may want to make sure you do the meal planning and grocery list, but could have someone else do the grocery shopping or use a delivery service (some of which are free depending on how much you buy). You also may clip coupons and do other things as part of your process. You should consider how much each part of your system/process is costing you in terms of time and energy. Declutter any part of your system that doesn’t warrant it’s cost. Redesign the system to fulfill your intended outcome. Just like you did with the space, reflect on how the system could work better. Be creative! Keep all ideas on the table. But remember to design it in a way that seems natural for you and your family. Keep it personal! Maintain the system. Just as before, check in on how the system is working from time to time. I have shared a few of my favorite systems below and those have all evolved over time through reflection and continual improvement. Student Informal Assessment Information: I used medical chart file folders for my student notes and samples of their work. But I wanted to keep track of those daily observations and interactions I had with students that contributed to my overall assessment of their progress. I got little spiral notebooks for each student and put them in a small pencil basket by my desk so they would stand up. Each day, I would pull the first 5 notebooks and make notes in their notebooks as I observed those 5 students throughout the school day. Then I would stick those 5 notebooks at the back of the basket and pick the front five for the next day. By the time progress reports came around, I had at least 8-10 days of observations to draw from as well as their work samples. Meal Planning with Emeals.com: I’m always trying to juggle nutrition with budget-friendly menu plans which can be time consuming each week. At our house, we now use emeals.com a menu-planning online service that works out to less than $1 a week which is totally worth it to me to eliminate the time and energy in menu planning and creating the shopping list. Emeals allows you to pick a menu plan (gluten free, paleo, vegetarian, slow cooker etc.) that works for your family. Weekly, the site will send you a meal plan and shopping list! WIN! You could also set this up yourself by doing several menu plans and shopping lists at once and then rotating them throughout the year. House Chores Chart: When my daughter was born and I went back to work, I realized I did not want to be spending my whole weekend doing chores when that was my only opportunity to do fun things with her and my husband. So I created a chore-chart. I wrote down all the chores I wanted to do each week, then I just divided them up throughout the week so I only had to do 10-15 minutes of chores each night rather than 1-2 hours on the weekend. It was one of the best things I’ve done to keep my house running smoothly, and it’s now just part of my nightly routine after my daughter goes to bed. It takes a few minutes and then I’m done! And best of all, I’ve reclaimed my weekends! Family Scheduling: Keeping all of our activities and schedules organized is definitely a challenge! We use a whiteboard and write in all of our weekly activities (color-coded by family member) on Sunday afternoon. We talk about it and work out any difficulties. This also gives me a chance to make sure my meal schedule will work out with what we have going on in the afternoons. Sometimes I work in a crockpot meal or going out to eat on nights that are going to be tough. So, there you go! A few of my favorite tips and best ideas to motivate and inspire you to get yourself organized! It’s an effort that will be worth it! Trust me! Getting organized for back to school will help you be more focused and less stressed. Best of all, it will set you up for a year of wholehearted teaching because you will be focusing on the right things!